The saying goes, “these walls have ears.” No doubt – your customers are always listening. They’re also looking – actively searching for new ideas and solutions. And high-quality wall murals, one of the leading printing and graphics solutions we provide at SpeedPro Imaging, turn your walls into works of art capable of delivering powerful marketing messages. Regardless of the business, you’re running, be it an auto dealership, a restaurant, a marketing agency or a medical practice, you’re missing out on a massive marketing opportunity if your walls aren’t speaking to your customers. Part of the appeal of high-quality wall murals is the versatility. An easy application process allows them to be used in both indoor and outdoor settings. No stone should ever be left unturned when it comes to making sure your customers know what you’re saying…and wall murals provide you with a big, bold and vibrant vehicle that consistently delivers those messages. Wall mural lifespans triple that of paint – 7-10-year lifespan for high-quality wall murals v. 2-3-year lifespan for paint. Wall murals are versatile and act as a defense shield – high-quality wall murals are more durable and much easier to maintain than paint. They also assist in protecting the wall surface in ways paint simply isn’t capable. 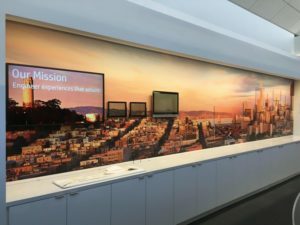 And quite simply, wall murals are more effective – high-quality wall murals grab customer attention with vivid, vibrant graphics and targeted messaging. After vetting three graphics firms, (Dabba owner) Andy Mercy said he chose Speedpro Imaging because it provided the best combination of services, including its overall input on the process, color sampling, scheduling, and price. It designed a big, warm, brand-mirroring graphic that was perfect for that long thin wall that Mercy wanted to cover. Restaurants – When diners feel more at home, they’re more likely to make a return visit to your establishment. Let SpeedPro Imaging improve the ambiance in your restaurant to get them to stay longer, drink more and order additional menu items. 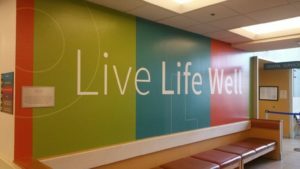 –Wall-coverings establish a home aesthetic that makes patients feel more at home and less like they’re inside an industrial facility. That, in turn, supports wellness and helps promote the therapeutic qualities necessary for patient recovery. add character and warmth to space. 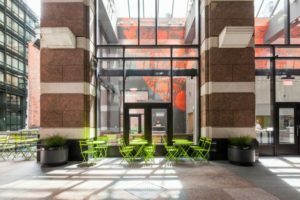 They transform a cold, drab cubicle filled office space into a positive, upbeat atmosphere filled with warmth that bolsters creativity. showcase a business’ logo and brand. 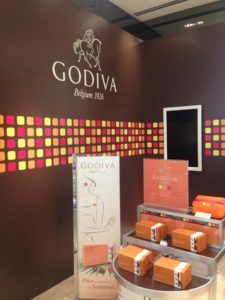 They are a cost-effective way to highlight the brand’s key messages/value propositions or specific limited-time offer products. 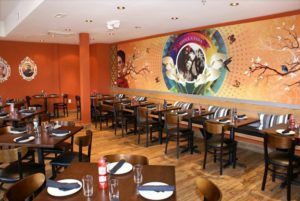 Regardless of the high-impact statement, your company is trying to make, all SpeedPro Imaging business owners are ready and willing to tailor a customized, high-quality wall mural that will generate the results you’re seeking. We’re proud to be leading the wall mural charge at SpeedPro Imaging and would love to help you customize a product that specifically fits your needs and budget. We all know your walls have ears. Now’s the time to give them a voice, too! Feel free to check out the high-quality wall murals on our website and reach out to your local SpeedPro studio to get started.